Starting around noon in Lancaster, PA and hoping to arrive in Erlangen, Germany, also around noon local time, next day, and six hours ahead. 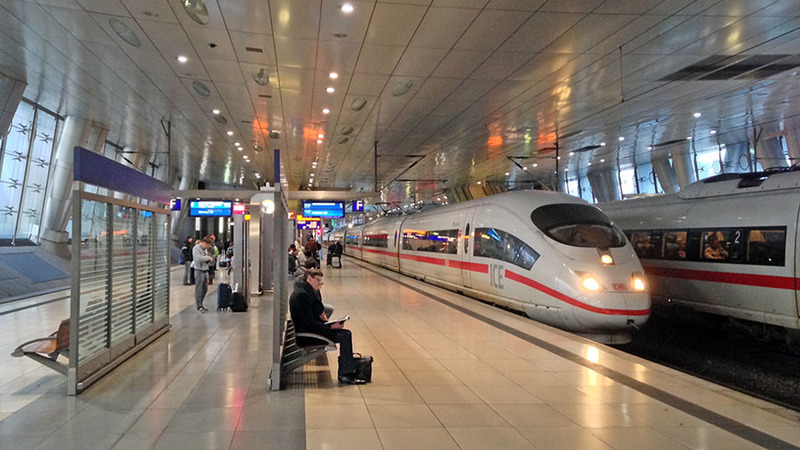 Two trains in Pennsylvania, a flight to Frankfurt, and two trains in Germany. 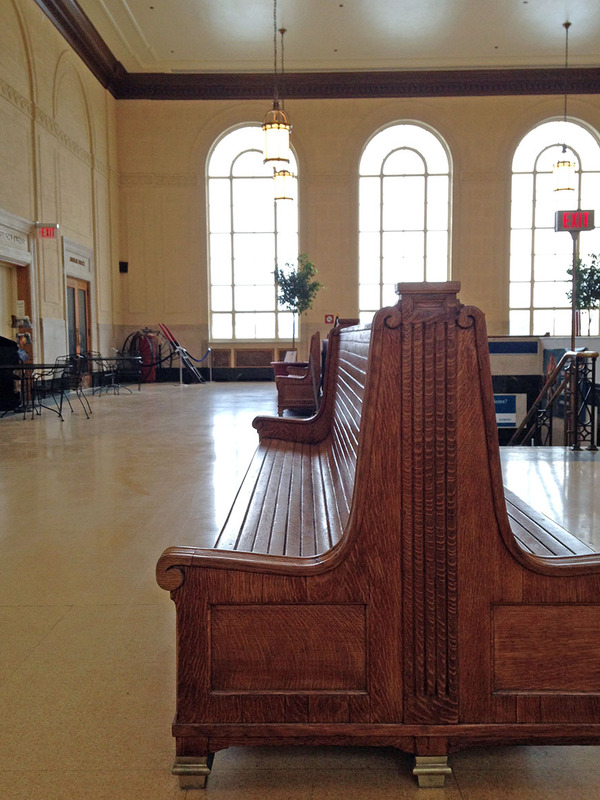 Not much happening at the Lancaster Train station during the middle of the day. After crawling along for what seemed like an eternity, we arrive at 30th street station in Philadelphia. Is it possible to catch the same SEPTA train to the airport? Yes, just a few minutes to spare, and even enough time to buy the round trip zone four tickets to save the trouble and extra expense of paying the conductor. 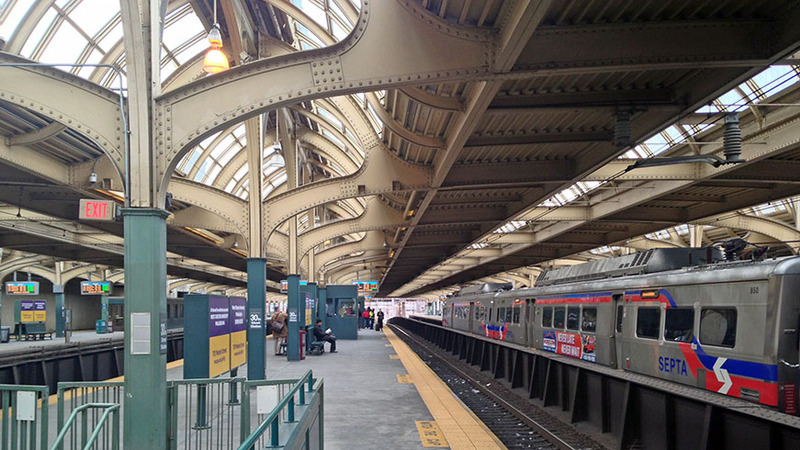 Philadelphia 30th street SEPTA station, distinctive and interesting design. In Frankfurt, arrive terminal 2 20 minutes early from a strong tail wind. Breeze through passport control and then to find the monorail to get to terminal 1 so I can walk to the Fernbahnhof to catch the Deutsche Bahn ICE train to Nuremberg. 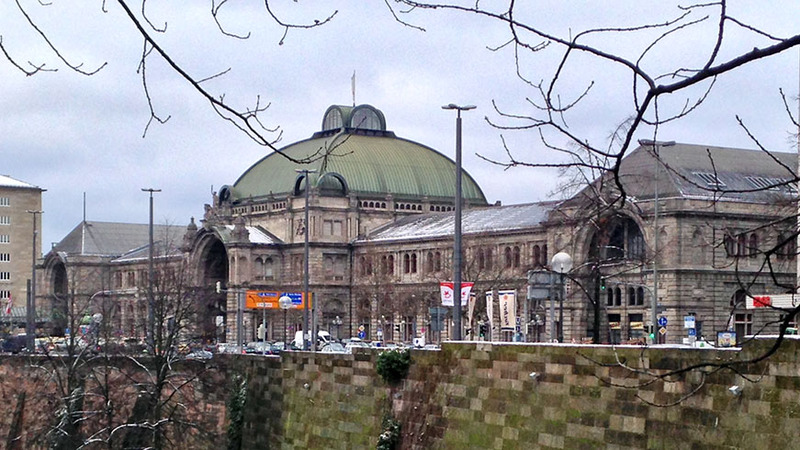 Early morning at Frankfurt Fernbahnhof main hall., daylight is hesitant. I was able to use the wait time to create a makeshift breakfast on the cheap at the Rewe at the far end of the hall. 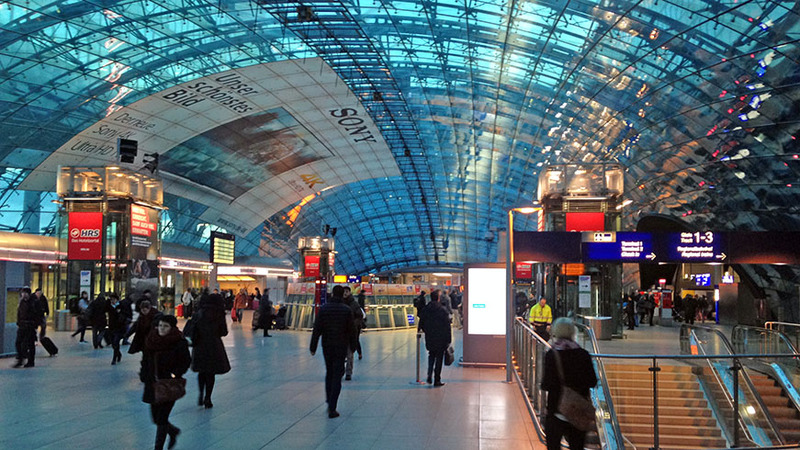 Departure platform at Frankfurt Fernbahnhof and the ICE train to Nuremberg, just more than two hours. This ICE train was full, but not crowded. I was able to find a seat not previously reserved and settle in for the trip to Nuremberg. This route goes through Frankfurt Hauptbahnhof and a nice surprise for me was that we entered one direction and left the same direction – therefore my previously looking where we’ve been seat turned into a looking where we’re going seat. A strange thing about reserved seats on ICE trains, you can be sitting in an unreserved seat, but at the next train station, your seat may become reserved and you’ll be booted out to find another spot. Didn’t happen to me, but did happen to the couple sitting across the isle from me – certainly a most unpleasant experience. Nuremberg Hauptbahnhof from old city wall across the street. A quick train switch to go back a bit west and then north to Erlangen, my home for four days in Germany. 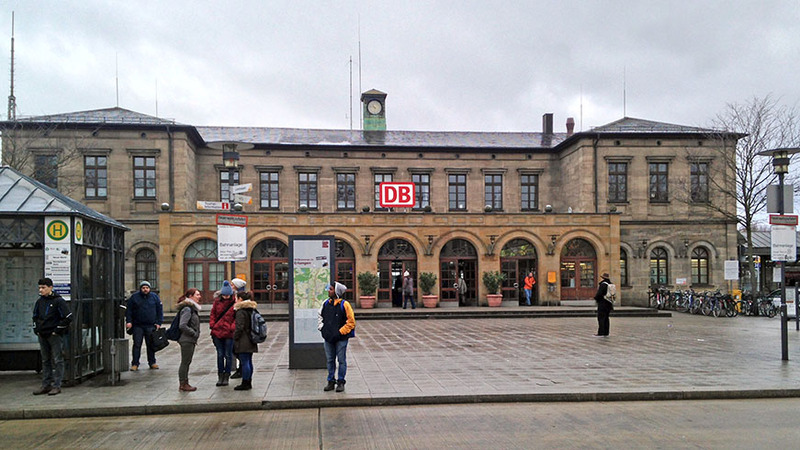 The Erlangen Hauptbahnhof isn’t quite as dingy as it looks on this snowy, rainy day. Erlangen is just a short 18 or 20 minute train connection to Nuremberg and really is a suitable place to stay for the Toy Fair without paying huge sums of money for a hotel. There are plenty of good restaurants, reasonable hotels, and an expansive pedestrian district and market square. 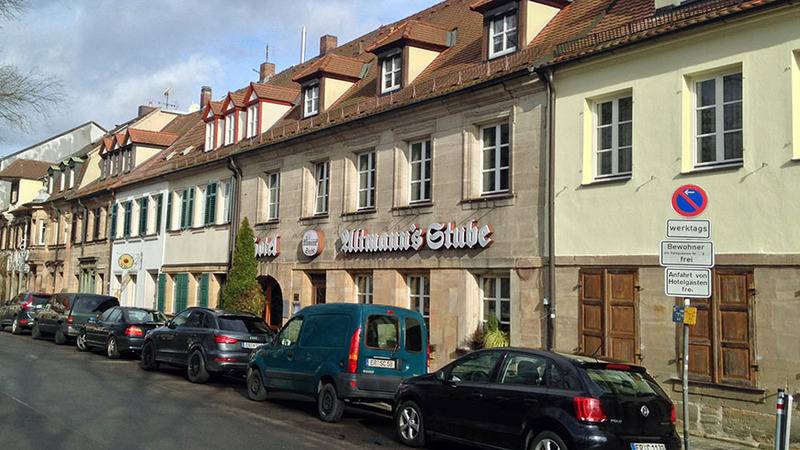 My home while in Germany, the Hotel Altmann’s Stube in Erlangen.